<p /> <small>Photos by <a href="http://www.amandacoen.com">Amanda Coen</a> for Ecouterre</small> <p /> Who would have pegged two burly, bearded men in matching lumberjack shirts and suspenders as champions of femininity and womanhood? 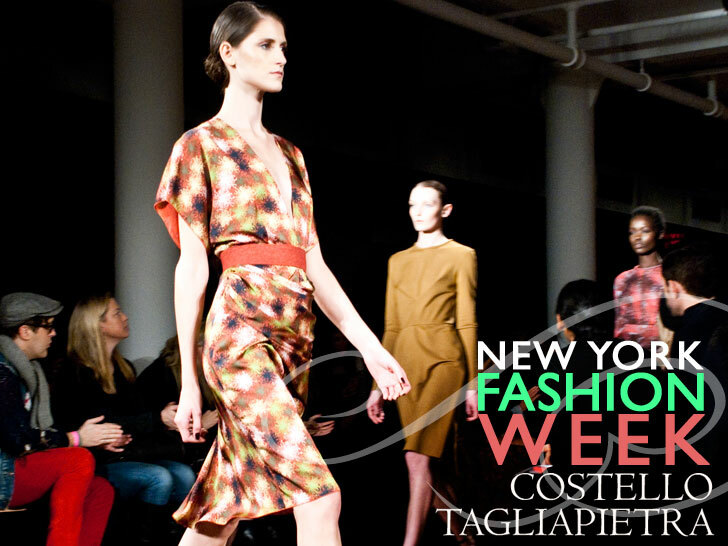 The world works in wonderful, mysterious ways, as do newlyweds <a href="http://www.ecouterre.com/costello-tagliapietra%E2%80%99s-spring-2012-line-embraces-classic-romance-at-new-york-fashion-week/">Jeffrey Costello and Robert Tagliapietra</a>, who unfurled their Fall/Winter 2012 collection at <a href="http://www.ecouterre.com/category/new-york-fashion-week-fashion-shows">New York Fashion Week</a> on Thursday. 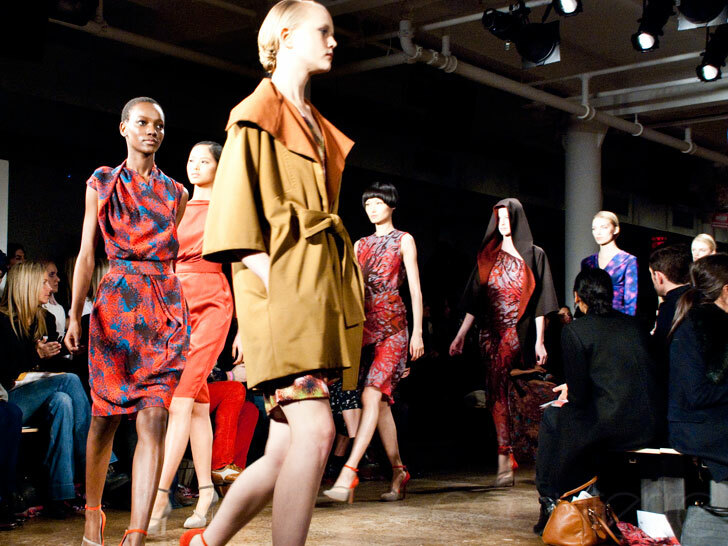 Decked in abstract chrysanthemum prints and complementary solids, the parade of frocks (and one mustard trench coat) swished down the runway in a technicolor explosion of amethyst, cobalt, and coral hues, courtesy of <a href="http://www.ecouterre.com/parsons-students-team-up-with-airdye-on-water-saving-fashion-collections">AirDye's</a> water-saving digital printing technology. 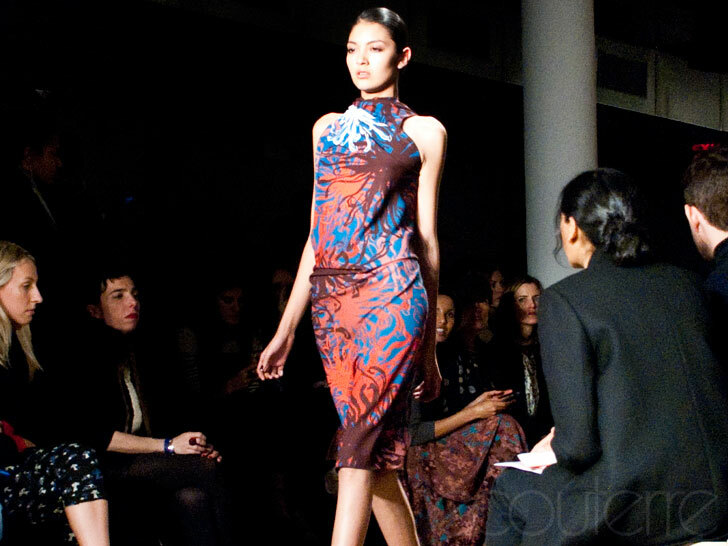 <p /> Costello and Tagliapietra's kaleidoscopic prints have become as much a trademark as their coordinating outfits. And in this instance, they led the collection. <p /> "Jeffrey had been painting these beautiful water colors," Tagliapietra explains. "We started layering them in Photoshop and throwing in different colors." <p /> The result, Costello adds, took on a "Beetlejuicy, <a href="http://www.inhabitots.com/new-dr-seuss-eco-plush-collection-by-miyim/">Dr. Seuss</a>-ish" quality. 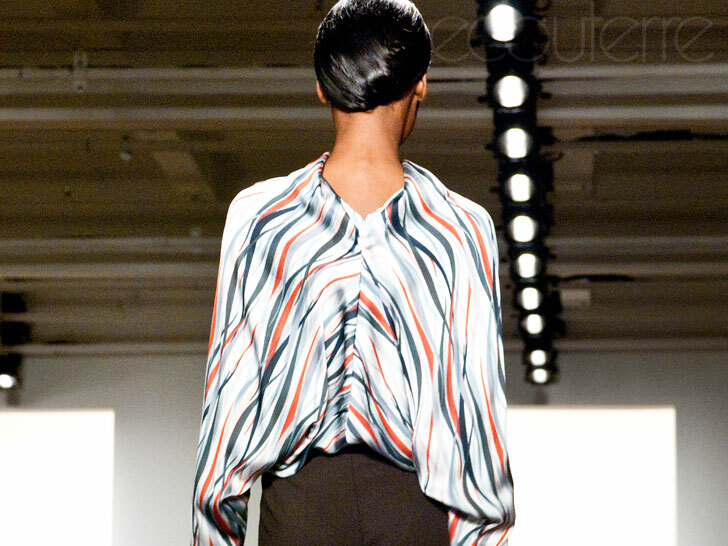 <p /> Because the AirDye technology uses computers to manage the application of dye to the textiles, Costello and Tagliapietra were free to define subtle variations in hue and tone. <p /> "With this process, you get these great iridescent, almost heathered colors," Costello says. "You can't get that with standard printing." 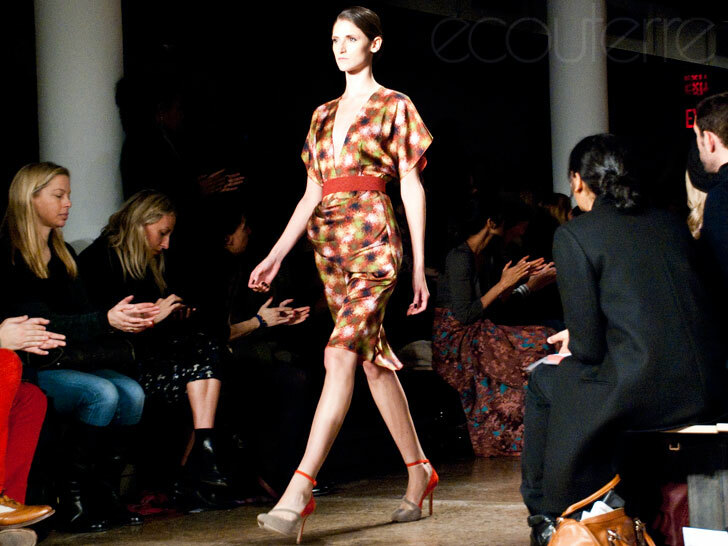 <p /> Each Costello Tagliapietra dress dyed and printed with AirDye saves 45 gallons of water, 95 megajoules of energy, and 3 kilograms of greenhouse gases, according to <a href="http://www.airdyesolutions.com/">AirDye Solutions</a>. <p /> It's a decision that makes perfect sense for the label. 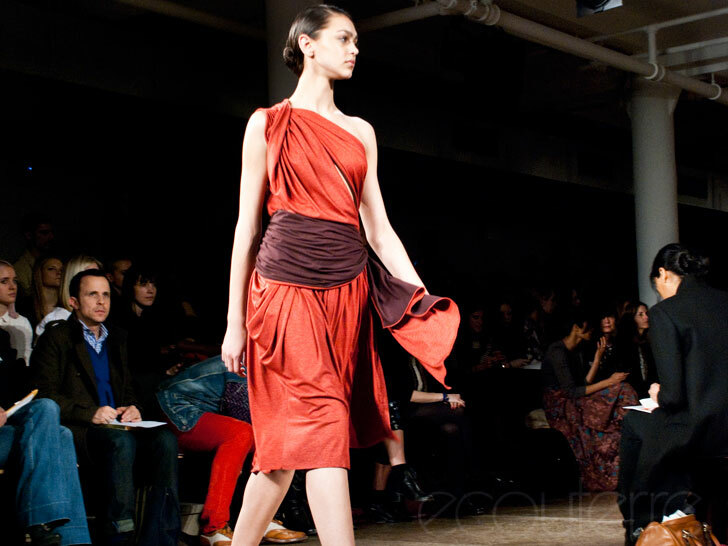 <p /> "You have to dye your fabric," Tagliapietra says, "so why not do it in an ecological way?" 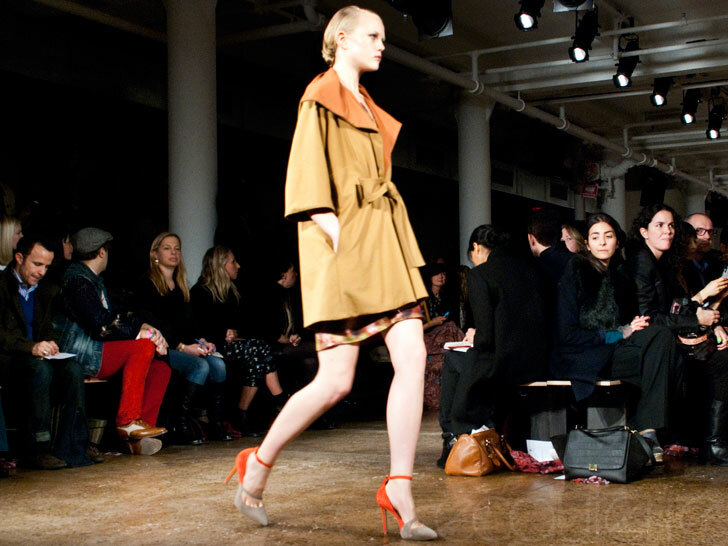 <p /> Costello and Tagliapietra are hard-pressed to describe what draws them to womenswear. <p /> "The obvious thing for us would be to do plaid shirts," Tagliapietra says. "You just do what you feel passionate about." 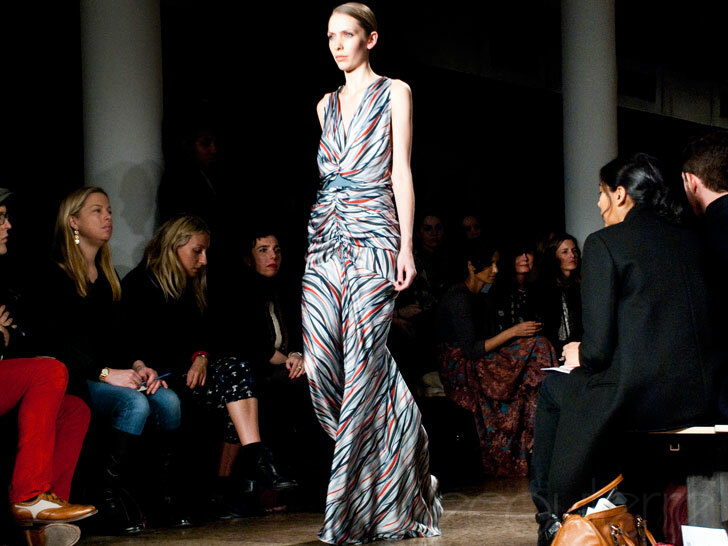 <p /> Asked to describe their collection, Tagliapietra utters the words "beauty, romance, and femininity." <p /> "It's just beautiful," he adds. "We love beauty."